This packaging was presumably designed alongside the Baby Back Ribs flavor. Similarly it has a discrete and well positioned company logo. The flavor name is jazzy and creatively delivered. The two tone colors work well as they graduate up the bag. The disc jockey and record image is completely unconnected and should not be there. It's all a bit busy but a graphic artist has had great fun designing it. These thick and crunchy Potato Chips are pretty much spot on for regular chips of a marcelled cut. Throughout the munching process they broke up nicely. While some makes absorb moisture too quickly and turn them into mush, these did not. The Ridged nature of these Chips provides good character and makes them attractively dippable. The Waves are wide and as deep as you dare make them with regularly cooked Chips. There is an oil soaked demeanour, and they are very light in color with little green parsley flecks dotted around. The Waves fall off the edges, rather than break up from a lack of crispiness. No Chips manufacturer would write 'Mild Pickle' on the front of their packet, but this is perhaps what this flavor leaned towards. There are clues; the inclusion of Cream, for example. 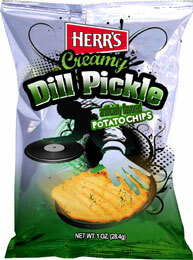 We found them really quite rewarding - a somewhat salty sweetish pickle that mixed nicely with a creamy overlay.